@FlambouyantTitan, I knew you could make it to the big screen. @FlambouyantTitan, so...how long will it take for me to watch attack on titan? @Phatphace, Right? This was so much funnier in motion one of the few times where this show stops punching you in the feels for you to have a quick laugh. But is he 3000% done? My friends encouraged me to watch this, its awesome. I started watching it two days ago and I'm on episode 6. I didn't think anime was good before, but it is great. You all should watch it on crunchyrol.com for free. There are ads but it's free. @You know you like it, there's a game? Is it in English? Nobody is fabulous with comic sans all over them. I don't always rate on a photo, but when I do, it has attack on Titan! 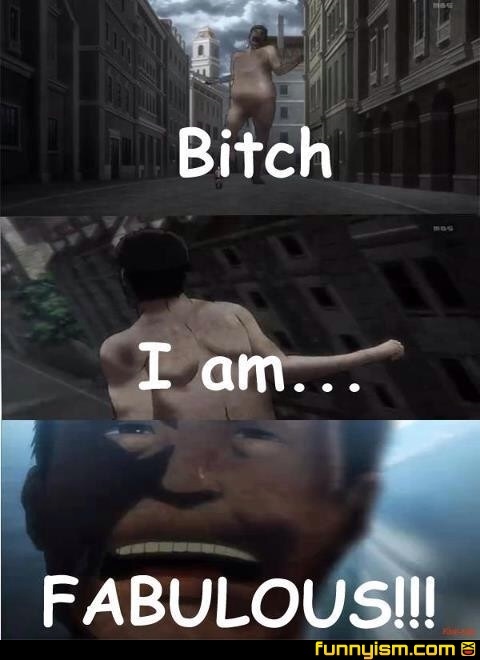 Attack on Titan is the reason I watch any anime. It gave me hope for the genre, and for that I thank it.